Patents, as legal records of novel and useful ideas, help drive regional innovation and economic growth. With strong biotech and information and communications technology (ICT) sectors, San Diego is a patent producing hub; according to the Brookings Institution, the region currently produces 2.3 patents per 1,000 jobs. Current legislation being proposed in Washington will make it more difficult for San Diego to innovate. Mark Cafferty and Greg McKee of CONNECT penned a piece in the U-T discussing how the proposed legislation could harm our economy. It is easy for San Diegans to forget that what happens in Washington can affect our lives some 3,000 miles away. But the San Diego economy, so strongly reliant on innovation across a spectrum of industries, could be severely harmed by Congress’ latest attempt at patent reform. Patents may seem to be a complex and obscure issue, but as legal documentation of intellectual property (IP) — just like the deed to a plot of land — they help drive regional innovation and job creation. According to the Brookings Institution, from 2007-2011, the San Diego region was granted an average of 3,165 patents a year, making us the eighth-highest patent producing region in the U.S. The California Competes Tax Credit, an economic incentive that is part of the Governor's Economic Development Initiative, is now accepting applications for its first round through Monday, April 14, 2014. California Competes is an income tax credit available to businesses that want to come to California or stay and grow in California. Tax credit agreements will be negotiated by GO-Biz and approved by a newly created “California Competes Tax Credit Committee,” consisting of the State Treasurer, the Director of the Department of Finance, the Director of GO-Biz, one appointee from the Senate, and one appointee from the Assembly. California Competes will be allocating $30 million for fiscal year 2013/2014 and it will increase next fiscal year to $150 million, and then finally $200 million for 2015/2016 through 2017/2018. A report released today found that international criminal enterprises are increasingly focusing on California because of its wealth and innovation. While this information can be off-putting at first, it’s good thing that San Diego is doing something about it. And it’s happening right now. This morning, in an unprecedented show of collaboration, the San Diego business community came together to grow the region’s cyber footprint. 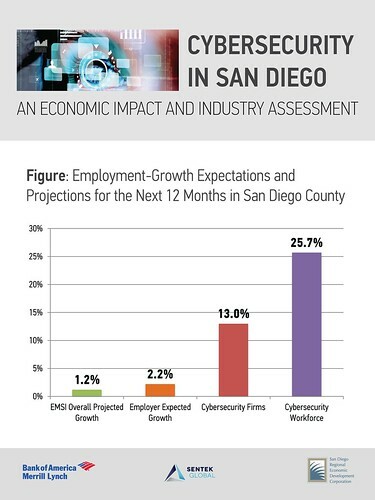 Released today, “Cybersecurity in San Diego: an economic impact and industry assessment” found that the cyber industry impacts more than 13,000 jobs and has a total economic impact of $1.5 billion, which is more than the impact of hosting three Super Bowls every year. San Diego, with its culture of innovation and military footprint, is in a position to lead the industry nationally. 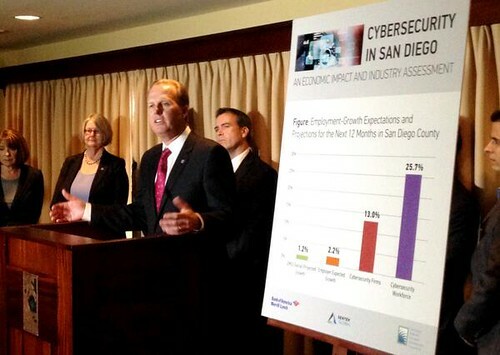 “Cyber can be San Diego's next big jobs generator,” said Mark Cafferty, president and CEO of San Diego Regional EDC. "Like biotech was 30 years ago, cyber has the potential to be a driving force for growth in both our innovation and military economies." City of San Diego Mayor Kevin Faulconer and Representatives Scott Peters (D- 52) and Susan Davis (D–53) joined us for the release. City of San Diego Councilmember Mark Kersey (D -5) and Council President Pro Tem Sherri Lightner (D -1) also were in attendance at both an industry event and press conference at The Lodge at Torrey Pines. Cybersecurity firms are expected to experience rapid employment growth. While the entire San Diego County employment base is expected to grow 2.2 percent from 2013-2014, cybersecurity firms are expected to grow by 13 percent. Overall, cybersecurity-centric jobs, such as software developers and information security analysts, are expected to grow by 25 percent. "If we care about creating jobs and growing our economy, than we need to support the cybersecurity industry," said Congressman Scott Peters (D). "I have supported specific cyber legislation in the past and remain committed to working together to advocate for an industry that not only protects San Diego's jobs, but also safeguards American companies." 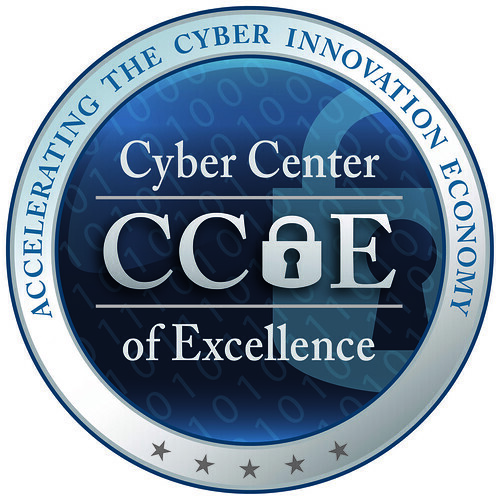 In an effort to accelerate this job growth strategy, the Cyber Center of Excellence (CCOE) – a partnership dedicated to accelerating the cyber innovation economy – has formed. Its powerfully diverse platform of leading cyber-related companies, military leaders and world-class academic partners are uniting in pursuit of a common economic-driven agenda to promote the region’s cyber strengths. Currently, the CCOE is comprised of an executive committee and is overseen by Holly Smithson of Sentek. Nationally, cybersecurity has emerged as a priority as global retailers, medical providers, and critical infrastructure fall prey to significant data breaches and cyber theft. Cyber has evolved to become more than just an issue of the government, and now is a potential threat to all businesses and individuals. In San Diego, more than 100 core cyber firms create a strong opportunity for the region to lead. On the heels of another round of sequestration, the cyber industry has even greater significance in both the national and local dialogue. Cybersecurity is one of two areas where the Department of Defense is adding resources. Locally, the cybersecurity industry is anchored by the U.S. Navy Space & Naval Warfare Systems Command (SPAWAR). SPAWAR alone impacts more than 6,100 jobs in San Diego and generates more than $705 million in total economic impact locally. 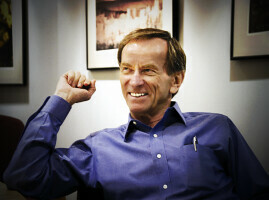 U-T’s editorial board penned a great op-ed on the importance of SPAWAR to advancing San Diego’s cybersecurity cluster. SPAWAR is central source of innovation for cybersecurity. More than 90 percent of SPAWAR’s $7.3B budget is put on contract with private industry. As the study suggests, The Cyber Center of Excellence will be partnering with San Diego’s prestigious universities to attract and train entry- to mid-level cybersecurity workers. As part of this commitment, EDC will continue its “iTrends @ UCSD” series, which will focus on cybersecurity. Open to individuals across all majors and schools, the program works to educate students about industries with growth opportunities throughout the San Diego region. Tom Clancy, Chair of Software San Diego said: “San Diego is very compelling to cybersecurity companies due to its incredible technical talent pool, and the close collaboration between industry and academia. We have an abundance of individuals with security clearances, universities with cutting-edge research and workforce training programs, and direct access to customers in healthcare, defense, mobile, finance and energy. The study was underwritten by Bank of America Merrill Lynch and Sentek Global. National University System Institute for Policy Research – under the leadership of president Erik Bruvold – authored the study. For a complete copy of the executive summary and full study, please visit https://www.sandiegobusiness.org/research/lvltw and look under the report section. San Diego is the best place to launch a startup in 2014. We’ll give that a moment to sink in. One of the criteria used to rank location is based on social media use of small businesses in the selected city. As the article writes, “It turns out that Internet-savvy businesses are likely to grow faster than those that don’t…. Web presence indicates adaptability and likelihood to innovate—creating a network effect for communities dedicated to growth and positive change.” There’s no doubt that San Diego has its share of social media-savvy entrepreneurs and small business owners. Recognizing this, EDC has recently brought together a group of these “Digital Ambassadors” to help carry positive messages about the region to the rest of the world. We’re constantly amazed about the powerful things we learn about San Diego through social media every day. Just yesterday, we learned that Google Analytics got its start in San Diego as Urchin. Although we have often been known to criticize the methodology of “rankings,” we need to celebrate where we can. And today, we celebrate! San Diego Is, in fact, the best place to launch a startup in 2014. Now, let’s continue to use our award-winning social media skills to get the word out.